In 2014, the L-Cheapo was developed to provide an open-hardware solution to laser cutting. The L-Cheapo Mark 1 hit 300% of its crowdfunding goal and was delivered faster than most crowdfunded projects in the same category. In 2016, the L-Cheapo Mark 2 refined the design, allowing most 3D printers to be turned into a hybrid tool that can not only engrave, but also cut wood, plastic, and leather. The L-Cheapo Mark 4 5.6W is now available! NOTE: L-Cheapos are made as ordered, it can sometimes take 5-7 days before your L-Cheapo will ship. Introducing the L-CHEAPO Laser Attachment (as seen on Indiegogo). If you have a 3D printer or CNC mill, you can easily add a laser to it. It can cut wood, most plastics, paper products, and engrave most materials. Got a 3D printer? Want to work with something you can't melt? Burn through it! With a friggin' laser. L-Cheapo raised over $39,000 during its Indiegogo campaign. If you missed it, you can order one here. L-Cheapo Indiegogo Campaign Video - Check out the Videos Tab above for more videos of the L-Cheapo in action. It can cut 3/16" wood and plastic, and engrave most nonmetallic materials. The module requires very little space. It lives on top of a 3D printer or CNC mill, and does not get in the way of using the tool normally. You can switch from laser to printer mode and vice versa in less than two minutes with no tools. No extra power supply or new software needed - just create a special extrusion profile for the software you already use (Slic3r / skeinforge /etc). Any hobby grade 3D printer will work, as will most CNC mills. OPEN SOURCE! The working drawings and schematics are published under a noncommercial license. Laser cutting opens up a lot of making possibilities. Desktop 3D printer and CNC owners, high school shop classes, small universities, and local hackerspaces can work with a wider variety of materials and techniques. Laser-cut parts are tougher than 3D printer parts. With this device, the initial dollar investment goes from thousands to hundreds. The diode operates at 445nm so protection equipment is readily available - a pair of laser protection glasses is provided with each module. 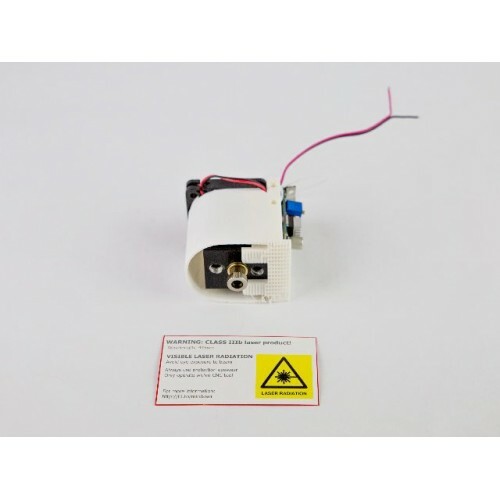 L-Cheapo 3.5W Module with 2 pairs of Laser Safety Glasses (works with both 12V or 24V printers). Free US shippping (International shipping will be invoiced separately when ready to ship). Optional: Extra Laser Safety Glasses - $5.00 per pair (look for the product link in the related products tab). Shipping: US Shipping is included, for International Shipping, choose the appropriate checkbox above. NOTE: L-Cheapos are made as ordered, it can sometimes take 5-7 days before your L-Cheapo will ship. MK Borri is the owner and chief engineer at Robots Everywhere in San Rafael, California. He has been building autonomous drones, data loggers, and telemetry equipment since 2007. You are old enough to vote in your country of citizenship. You know the potential hazards in using high power lasers. You will wear professional laser-eye-protection when operating the laser. You will use this device in a legal and safe manner. You relieve the seller and manufacturer from any liability arising from the sale or use of this component/device/item. You will NEVER use or run this device outside of a CNC tool, or in front of crowds/bystanders. All items are made on REQUEST, so no refunds OR warranty given. However, we will work with you to replace DOA components. Does it need special firmware or software? No, you'll use everything you already have for your printer. Do you have a thing ID on thingiverse for a mount for my printer? New mounts are being added, check the Thingiverse link in the links tab above to see if your mount is there. What do the mounts look like? This is the "generic" holder (Version 1), the horizontal part is intended to be zip-tied on top of the extruder stepper. Can this be used with a Delta printer? Delta printers will work as long as they can move at least 2500mm/min horizontally. By the look of it, the laser will have to be mounted carefully, but it should work. Will it work with Printer X? 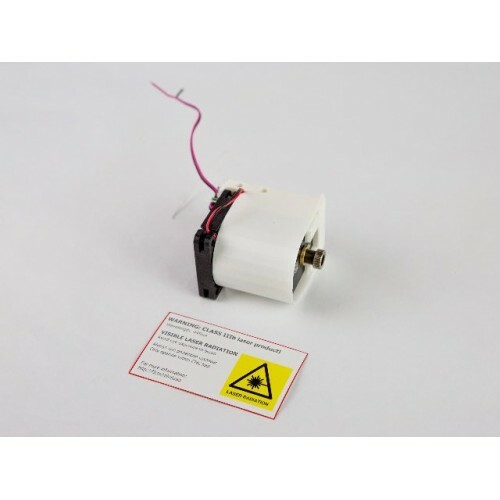 Long answer: If your printer has two wires going to the extruder heater, and runs on 12V or 24V, it will. All RAMPS-based printers (Makerbot, Solidoodle, Type A, anything with a Sanguinololu on it will work. 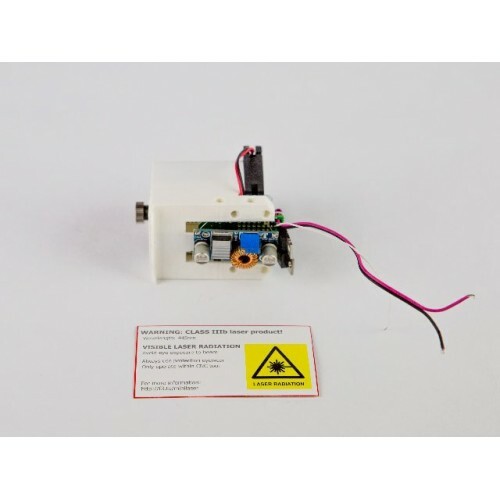 However, if you have a 24V printer, you must order a 24V because it has a slightly different PCB (Note: L-Cheapo v2 [Mark 2] works on both 12V and 24V). Is my printer 12V or 24V? L-Cheapo Laser Cutter Parts by spiritplumber on Thingiverse - Mounts for the module (including the RigidBot Mount). L-Cheapo working drawings and schematics - Non-commercial license. If you want to make and sell this design, please contact the inventor. 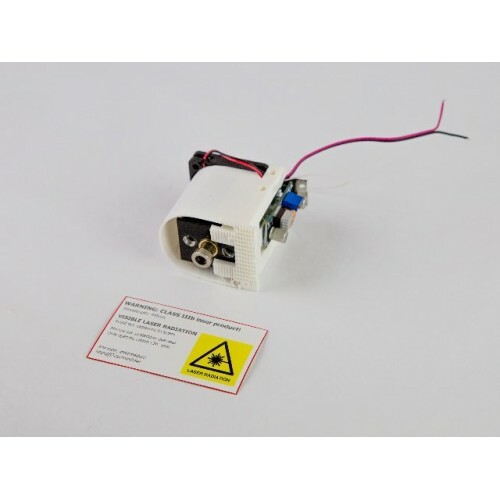 L-Cheapo Mark 2 - Improved output, smaller size, works on 12V or 24V! Go from 3D printer to laser cutter in 2 minutes -- with one hand! 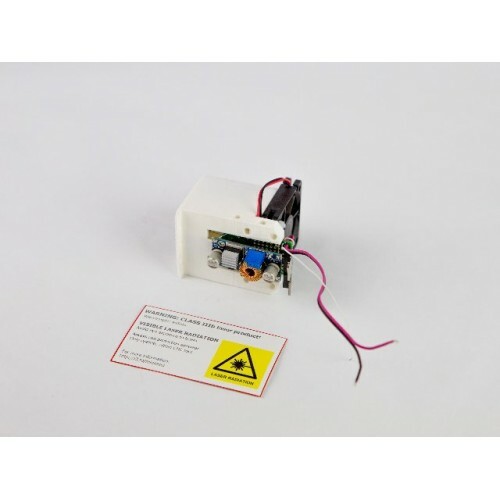 The laser module does not affect your printer's speed, and can be used to engrave cardboard. Powerful enough cut through 1/8" acrylic. We shipped the first laser by drone. Engraving a proto board is about as good as a silkscreeened PCB for one-off projects, and at zero marginal cost! Even at 75% power, the module is sufficient to light a grill... good thing, too, we were legitimately out of matches!